It’s a plot that you can’t help but like. A mission to another planet with a spaceship crewed by a collection of forgotteable TV actors! But something goes wrong and these people start to die! One guy hangs himself and another guy has a heart attack during a particularly intense virtual reality session! There’s even some drug overdosing going on! Is this a spaceship or one of those motels with weekly rates? The movie though isn’t all about how past problems like drugs, suicide, and underemployed actors continue to haunt us in the future. It still maintains a nice dollop of the expected “horror movie in space” motifs we demand in our thoughtless-provoking sci-fi. The captain of the ship for instance is one of those guys who doesn’t make it through suspended animation! You know that guy! Everyone wakes up, but there’s always some grody looking corpse in a busted sleep chamber. It happened to hapless astronauts at least as far back as 1968’s Planet of the Apes, so you know that’s futuristic gold! You know what else every good, great, and entirely anonymous space movie (Star Quest for example) needs? A pyscho android! I don’t know that I’ve ever been on a spaceflight yet where the android didn’t get his hard drive in a wad for some reason and started trying to manhandle all the wetware on the ship! 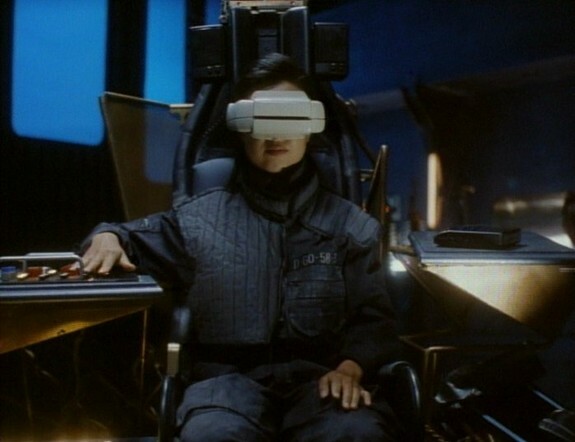 What’s even worse is that usually these androids are the undercover variety which means that they look like you or I (if you are I looked like an actor desperate for a paying gig) so we never see these things coming until the rest of the astronauts are smacking the android with hammers to no effect. What really helps in maintaining their cover is that we are never sure if their robotic like speech and movements are because they are really an android or just because they can’t act! 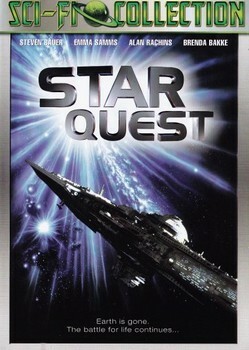 Despite all this dying and android angst happening, Star Quest still manages to bend the law of physics by clocking in at less than 80 minutes, yet seeming to be infinitely longer! There isn’t a whole lot beyond the crew members sniping at each other going on for the first half of the movie. With the captain dead, a new, unpopular guy assumes command. Though his sour disposition is the most obvious reason for this dislike, I can’t help but believe that the fact that he’s sporting a toupee that looks like the pelt of some alien creature played some small part in everyone’s distaste for him. The crew is an international one which means we are subjected to a variety of bad accents as well as some bogus tension between people from different countries. When the Russian complains that the British chick is too reserved and the British chick retorts that the Russian is suffering from her Russian paranoia, my American apathy was kicking in big time. There’s also a French guy who sounds like he’s a moronic hayseed from Lousianna when he speaks. No wonder that android went crazy on all of them! Predictably, once the movie ramps up the action for the big finish, it goes from being merely an annoying curiosity (why is the Russian chick smoking cigarettes on the spaceship? Why is her virtual reality session taking place during a violent demonstration at Red Square? Why is everyone so worked up over “Federation” regulations when there’s only five or six humans left in the universe?) to an increasingly dunderheaded collection of familiar space movie elements. 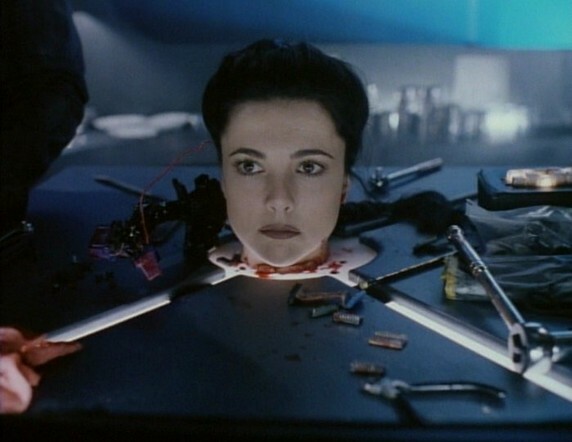 How many times do we have to see the scene where the android’s severed head is hooked up to a bunch of wires so that it can be interrogated by surviving crew members while it taunts them for their own lame humanness? And what is the deal with the self-destruct sequence on spaceships? I’ll admit that it’s been a while since I’ve been on a space shuttle, but I don’t recall that it comes equipped with an auto destruct button (though you could probably tastelessly note that it really doesn’t need one). Cars, buses, trains, planes, and boats don’t have any gizmo that lets you blow it up as a computerized voice counts down the seconds towards detonation. So why would anyone building a spaceship put that in, except to increase the tension at the end of a movie? And why is it always so hard to shut off the self-destruct? Seems like that’s the kind of thing you want to give people some leeway on if they change their mind. When the movie finally reveals its first shock ending, it doesn’t come as a shock ending so much as just a bit of a tacked on cheat. Without giving away too much, based on what had already happened in the movie, the big reveal wasn’t really justified or realistic. Here’s my big reveal about their big reveal – do some psychological evaluations of your crew members and don’t hire a bunch of egocentric jerks to fly in close quarters for a long time in space. These astronauts had their own rooms, a VR machine, and could smoke on board! What more do you need to keep your sanity? 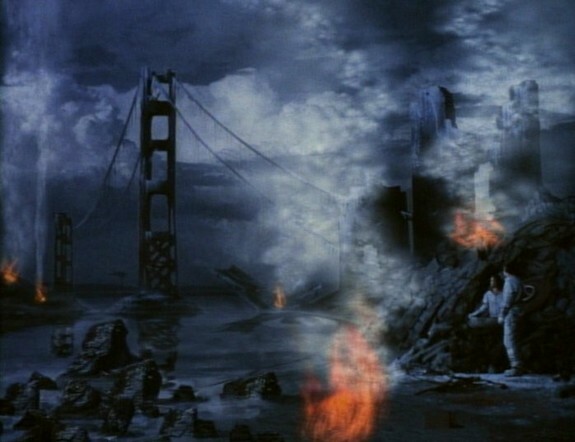 The final shocker isn’t unexpected, but does give you a chance to see perhaps the worst matte painting used in a movie ever. On the other hand, the movie gives you the best scene ever of an android’s severed arm being used to fly the spaceship. Of course, that arm turns traitor and tries to blow everyone up, but that’s just another day at the office in deep space, right?